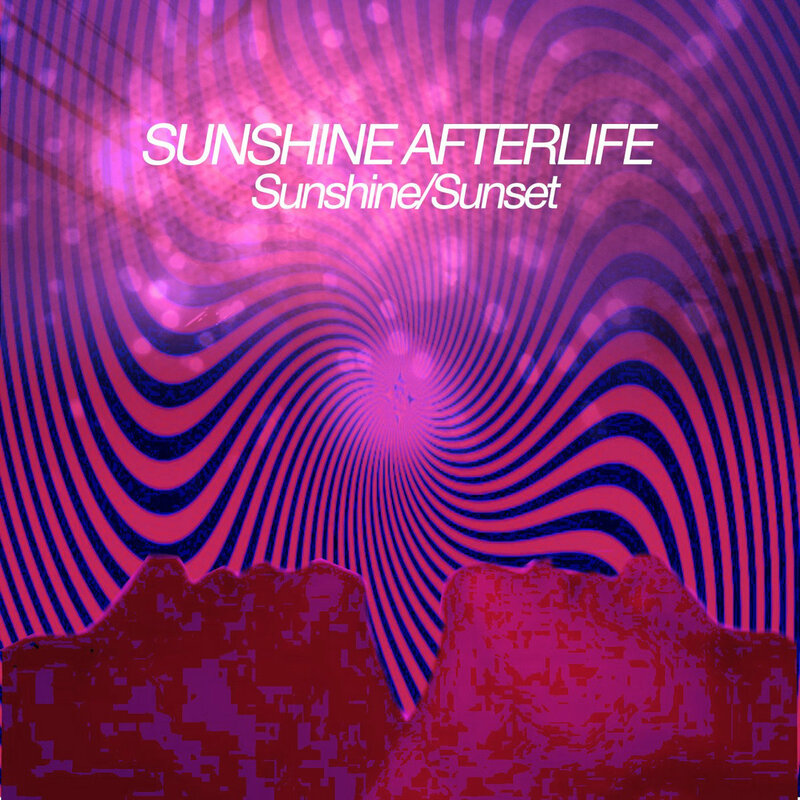 Sunshine/Sunset, the latest release by the duo Sunshine Afterlife, comprised of vapordrone producer Princess Commodore 64 and ambient artist Streymoyer, is a truly transcendental journey. Combining the trademark sounds of both artists this album is a mixture of deep synthetic textures, soaring futuristic synthesizers, field recording atmospherics and mangled plunderphonic noise. The result is a mesmerising exploration of the uncanny which focuses on the interconnectedness of the spiritual and the mundane. This project was described by Streymoyer as the journey of a lonely wanderer “going from the suburbs to the astral plane”, an aural experience which Princess Commodore 64 explains was a way of exploring his own personal relationship to spirituality and keeping himself centred. The album opens with It’s a Love Thing that eases the listener into their journey, beginning with a heavily filtered field recording that conjures up a sense of disassociation and strangeness. As the listener becomes accustomed to their awkward surroundings a synth emerges offering a sweet but drawn out melody reminiscent of Blade Runner. This moment of clarity dissolves organically into a delayed mush that pulses gently, as the second track Collect Your Records and Change Your Number rises up punctuated with subtle percussion hits that build into shimmering splashes of electronic sound. The effect is a swirling, delicate vaporous veil that shrouds the listener in an ambience which is at once fragile and sweet whilst still managing to be underscored by a subversive darkness. This use of juxtaposition is integral to the aural aesthetic of Sunshine/Sunset. A stylistic preoccupation which reflects the artists’ thematic musings on the presence of the extraordinary in the everyday. A contradictory state which is rendered through the disjuncture that opens up between their playful, tender melodies and the constant bubbling threat of confounded noise that continually wrestles the moments of beauty into submission. As a consequence, Sunshine/Sunset is quite a dynamic listening experience which oscillates between triumphant soaring moments of musical catharsis on tracks like How Long Is Now//What We Were And What We Will Be (Forever) which build up to these great heights only to break down and plunge the listener into a perpetually present shadow realm. There is also a gentle playfulness on tracks like Some Kind of Wizard beginning with an industrial rhythm which chugs and throbs in the murky depths of the mix leaving room for the delicate dance of distorted synths to flutter overhead like grime coated butterflies. The effect produces moments of levity and joy that emphasise a sense of space and freedom amidst the bleakness but which, like everything on this album disintegrates into a sprawling wasteland of noisy ambience. In many ways, the darker moments on this album sound like something from the sound design of Eraserhead, infused with a throbbing industrial menace which drones away in the background creating a real sense of tension. It is not surprising then that both artists cite its creator, David Lynch, as a major artistic influence which Streymoyer explains inspired the pair to make music that evokes a supernatural air of something always beyond our grasp. And in keeping with this, there is something eternally fleeting about the disparate musical ideas flow across these nine tracks, a constantly shifting parade of moments which arrive unannounced and evaporate at the edge of consciousness, leaving a phantasmal psychic residue that plays with perception. Perhaps reflecting the more spiritual or metaphysical aspects of the album, this tendency conjures a strong sense of drifting time and impermanence. Sounds float in and out of the frame never quite establishing themselves, always leaving the listener to question their perpetually fading memory as if it were a comment on mortality itself. What makes these tracks particularly immersive is the way they unfold so organically. According to Princess Commodore 64 this unique feeling was created by the duo’s collaborative approach which was more akin to the workings of a jam band than electronic music. Princess Commodore 64 was responsible for providing the foundations for these tracks, constructing disfigured sample loops which were passed on to Streymoyer to jam over. The result is nine free wheeling synthesizer workouts that sprawl into epic sonic landscapes taking many unexpected twists and turns that culminate in the album’s centrepiece, the gargantuan A Song For An Old Man (BOB). A nearly 17 minute odyssey which needs to be experienced to be comprehended, and well worth the investment of the time it takes to do so.